I have got dealer option splash pan (no radiator drain hole version). But I need to repaint this. Dose some one know original finishing of paint work inside and outside ? I remember one of my Z's having one on it many years ago and I'm fairly certain it was black. I'm not sure if it was a semi-gloss or matt finish on it though as it was on a street car that had a lot of miles on it and the finish wasn't in very good condition. Gloss black enamel - same as the cross member and suspension. Thanks ,Is it inside and outside ? It's the same color inside and out. Sorry, both incorrect. It was plain steel pressed and wasnt painted at all. I have this on good authority. If you have a workshop manual and you look through the pics in there you will see that it is a very light colour (ie black and white photos) which indicates to me that the info I have is correct. Just strip it down and clear coat it for the original look. Sorry to go against the concensus on this one. Hope this helps you out. Maybe we need more help on this one, as it's quite possible different markets got different things as is usually the case. Like I said I have it on good authority that they were just plain pressed steel from the factory. I think that the later ones (ie for the 260z/280z) were black as I use to own a 75 260z (yes, they exist here in Australia) and it had one that was black. The person I got the info from use to work for Datsun back in the 70's and purchased one over the parts counter for his car. I believe that the 240z used for the photos in the official Nissan workshop manual is a LHD USA specification car. If you have a manual take a look at the towing section which is within the first few pages and also the front suspension section and there is some good pics in there. Wish I had a pic to post but unfortunately I dont. Mine is currently painted black and I plan to strip it and clear coat it for the original look. Please post any more info that you find. At this stage Im happy to stick with the plain pressed steel finish. I just hope that the original poster of the query hasnt been able to get to the auto parts store as yet to pick up their rattle can of gloss black. When I bought my 1972 UK spec 240z in 1988 the splash pan car had no paint at all on it (just 16 years worth of heavy rust) As far as I can tell it had never been removed from the car either. All the others I have seen (very few have them) were painted black. Even on early cars. Like most Japanese domestic market models, my ZG had the Splash Pan fitted from the Factory. The Factory actually called it "BOARD-splash" part no. 78410-E4100. I took it off to paint it last year, and took it back to bare metal. It had a very Factory-looking coat of semi-gloss black paint on the inside, and somebody had hand-painted the outside at least once in the past. The inside paint was covered with a nice layer of accumulated oil and dust residue that had protected it. There was an original Factory part number sticker still attached to the inside, and it was attached OVER the layer of semi-gloss black paint. When I got my first early Z car ( a 1971 UK-market HS30 ) it too had a VERY scruffy Splash Pan on it, and that was also semi-gloss black painted. Something about that paint looked "Factory" to me. It just looked like a nice thin protective layer in the 'correct' colour. I don't know if anyone will grasp what I mean when I say it LOOKED Factory / original finish - but that's what I am trying to get across. When you buy Nissan parts as spares, I have noticed that they are often supplied in a different finish to how they were when they came attached to the car. When they were putting cars together at the Factory, they did not have to worry about how the parts would fare in storage; they just put them together and painted them with the rest of the car. Parts that went into the spare parts network were sometimes painted or plated to protect them in storage. 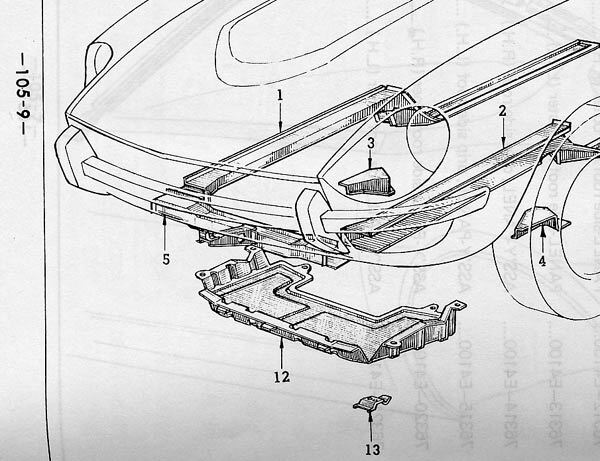 I would cite bonnet hinges and tailgate hinges as an example of this; when you buy new bonnet hinges from Nissan they come in the gold-passivated Zinc finish that so many other parts come in. When they were originally attached to a car on the production line I BELIEVE they were NOT plated - and were just painted on the car. Maybe they had a thin layer of primer at the point they were manufactured, but I don't think they were electroplated. So, what I am saying is that I think the situation for parts bought over the spares counter, and parts that were originally attached to the car on the production line, is different on a case-by-case basis. I think this must confuse the situation as regards to what is the correct "Factory" finish for an assembled car? Having said all the above, its curious that Joseph's story details a different ( opposite ) case to what you might expect. I would have expected that a part coming through the official Nissan spares system would have been protected in some way whilst in storage / transport. It would not surprise me to learn that Nissan put the Splash Pans on the cars at assembly time without painting them ( seems they did a fair bit of that ) but I would have expected a spare one to be at least primed or phosphate coated like the Factory replacement body panels were? I had a set of painted hood hinges plastic media blasted and they were zinc chromated (gold Passivated?) under the paint. What I cannot tell you is if they were painted when they were on the line in Yokohama as the car had been repainted the same color. My guess is that they shot them in japan as I've seen a few original, unrestored cars and they are painted body color. I kept mine in Zinc cause I must have a fetish about that color. I want a splash pan! why did Nissan cheap us out? Alan makes a good point about various finishes applied to various parts. For instance, primer used to cover replacement parts is different from the primer used on the car. Parts applied on the assembly line were indeed different in many cases from the replacement parts ordered separately. I followed a conversation on IZCC about the color of the tail lights. I have discovered a few "early" parts for which there is no reference! Applied on the early assembly line and subsiquently dropped from production. Certain authorities claim the piece is aftermarket when I know well it is from the factory. In many cases, the original part design was changed when the first production lot was completed and a second lot was ordered. Screws changed, Plastic color changed. The first ash trays were grey plastic painted black. All the rest are black plastic, for example. My point is that there are many subtle part differences and that there is no technical "correct". I think it is one of the many aspects of enjoying Z's. I think it would be a shame to discredit a car represented as original because some aspect doesn't match another car. We nit and pick, but it is fun for us. My car came without a fuel vapor recovery system. The gas tank is different and the plumbing is missing. The cable used to pull the wiring harness over the wheel well was left in the car. My correct is different from your correct! I hope we continue to have conversations like this one. I never would have guessed the splash pan came other than glosss black. Did the US spec 240 Z's come witha spalsh pan. I have owned 3 of them, and have seen dozens of others and cannot recall ever seeing a 240 with one fitted. I "believe" that the only US spec 240z's that came with the splash pans are from 1973 forward. Neither my previous 1971, nor my currently owned 1972 Zcar came with the splash pan. Mine from the 73 Z was finished in black, though I don't remember if it was gloss or not. My point is that there are many subtle part differences and that there is no technical "correct". I think it is one of the many aspects of enjoying Z's. I reckon if anybody thinks they understand EVERYTHING about the detail changes of these cars then they probably do not know what they are talking about. We can get pretty close on some specs. ( based on reference with other cars ) but I can't see how anyone could say with 100% certainty what is 'right' and what is 'wrong' for each particular car that came off the line. Maybe we could get 99% there, but that last 1% is impossible to prove. Its fun to TRY and understand it all, and people like us should keep discussing it and throwing ideas and evidence around. In the end, some of it starts to make sense. With regard to the Splash Pan ( "BOARD-Splash" or "Splash Board - Engine Lower" according to the Factory ) - it is listed in the 1969-on parts lists for the Japanese domestic market. I think most Japanese domestic market models had them from the very beginning of production, along with other markets that were expected to be "wet" ( like the UK! ). They get beaten-up pretty easily and fall foul of the demon rust at their mounting points, so they are probably missing from a lot of cars that originally had them. This is turning into a great discussion thread. The 240z scale model produced by Franklin Mint a few years ago has a splash pan fitted and it is black. This is meant to be identical to a factory produced car. Saying this though the exhaust system is also painted silver on the model and it was black from the factory. From memory (Ill have to check tonight when I get home) there is a white JDM Fairlady Z on the cover of Brian Longs book and I believe that you can pick up that it has a splash pan and it is plain pressed steel, not painted; someone may be able to verify this before I can. My source stated in an email to me that he has three splash pans, one which came on a car he bought new from the factory in 1970, one from a 1969 car and one that he bought new over the Nissan/Datsun parts counter and they are all plain pressed metal, not painted. It is also my understanding that they came fitted from the factory in the USA on the 1970 model cars. They were then discontinued from the factory and re-introduced as factory fitted in 1973 when the bad carbs were put on the cars and they were used to aid cooling of the engine. However, they were available over the parts counter throughout the production run. I can't comment on the cover picture of Brian Long's book, as I think my edition has a different cover pic to yours? The car on the cover of my copy is at an angle where you can't see underneath at all. I think different markets got different covers? I'm still scratching my head about this bare metal finish for the Splash Pan though. Surely they would have started to go rusty before they even got on the car? Did they not have ANY kind of coating ( phosphate / electroplate / primer / clear lacquer? ) on them whatsoever? How come mine had a part number sticker OVER the black paint on the inside of it? My car was built early in 1972, and I don't think its a replacement part. Joseph, I'm not doubting your word and the finish of this part is something that I profess I am unsure about - but it does not make complete sense to me. I know Nissan left some parts on these cars unpainted, but they were usually concealed in areas that were either difficult to paint or were hidden by trim etc. It just does not seem to make sense that they would leave an easily-seen and substantial part to go rusty. I've been driving these cars since May of 1970. Worked at a Datsun Dealership from 71-73. Sold a ton of new Z Cars ;-) I'll have to agree with Joseph on this one. I've never seen a splash pan for the 240-Z's come from the factory either on the car or over the parts counter - painted black. Not saying it couldn't happen, just saying that if they were painted black - it would have had to have been many, many years after they were produced. I agree with Allen - many of the NOS parts in the warehouse have most likely been repainted over the years to prevent corrosion. For example I have three brand new rear quarter panels - two are painted gray and one is painted black. I say "Painted" because primers will not prevent rust - metal parts left in prime will rust because primers are porous (epoxy based primers are not as porous and will prevent rust for a longer period). Normally the factory just "dusts" on a very light coat of paint on. 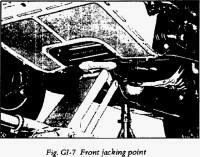 I can tell you that I ordered the splash pan for my 72 Z along with a radiator fan shroud over the Parts Counter in 72. The splash pan looked like plain sheet metal to me - but I agree with "Z Kid" - they must have had some other coating applied - nonetheless they don't rust just sitting on the shelf - so they are not truly plain "untreated" sheet steel. Most of them do rust after 20+ years mounted under the car and driven over the road. 1:36AM - - -Eureka!... I've found it! ;-). Part Number 74810-E4100 "Splash-board engine lower" (sticker still on it) When I get some daylight - I'll try to get a good picture of it. On close inspection - this one looks like it's been painted with a very light gray paint. ("Silver" would have a more chrome/metallic look - this one is a very flat finish - so I'll call it a very light gray). In the places that the light gray paint has been scratch - the metal underneath isn't rusting - and looks almost shinny compared to the paint - so I'd have to say that it was coated with something soon after it was stamped; and I'd have to guess a phosphate might be correct. The splash guard was not standard equipment on the US cars until late 73 - although a few very early cars (1970) did come through with them installed. (somewhat like the hand throttles - a few did come into the US on a few early cars). I'll post the picture when I get some daylight.. The 74810-E4100 number shows up as NLS in the Nissan Motosports catalog , but does show it it the one that fits the Z's up to 8/74. 74810-N4200 is for cars from 9/74 on. The later one in the Motorsports catalog is shown paintd black.